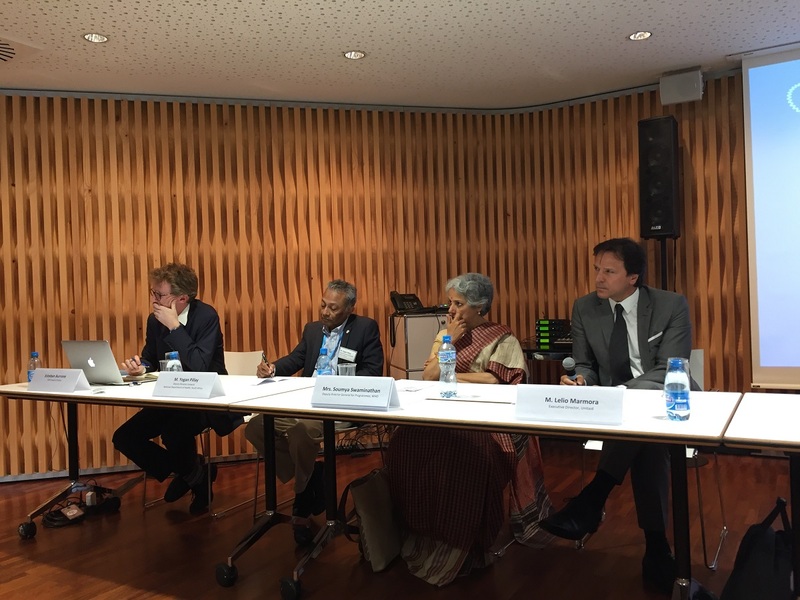 The results of the feasibility study [pdf] were explained in detail during an event jointly organised by the MPP, Unitaid, the Swiss Agency for Development and Cooperation, and South Africa on 24 May, on the side of the 71th World Health Assembly. According to the study, there is a strong case for the MPP to expand its mandate to include patented essential medicines in other therapeutic areas, beyond its current work in HIV, TB, and hepatitis C. The MPP would start licensing small molecules. As “a next step, the MPP will conduct a prioritization exercise to identify potential treatments for licensing, as well as explore fundraising opportunities to support its mandate expansion,” the document said. The MPP, created in 2010, also announced its new five-year strategy, which includes the extension of its mandate. As explained by Esteban Burrone, MPP head of policy, in 2016 the WHO and the Lancet Commission on Essential Medicines Policies recommended the expansion of the MPP’s mandate to include all patented essential medicines on the WHO Model List of Essential Medicines (EML) [pdf]. The Model List is updated every two years and a key question for the MPP was how to work ahead of the announcement of newcomers on the list, he said, adding that the feasibility study used the EMLWHO Expert Committee report to find out about future additions to the EML. The next update of the list is expected in April 2019, he noted. The feasibility study focused on five categories of patented medicines: those already included in the EML; those which the WHO Expert Committee considered as having relevant clinical benefits but lacking sufficient data; medicines that have clinical benefits but did not meet the WHO Expert Committee’s comparative cost-effectiveness criterion; medicines for which the WHO Expert Committee recommended a therapeutic area review by a separate working group; and new antibiotics for combating antimicrobial resistance. Burrone said that the MPP would be well placed to ensure both access and stewardship of new antibiotics, and could monitor compliance. 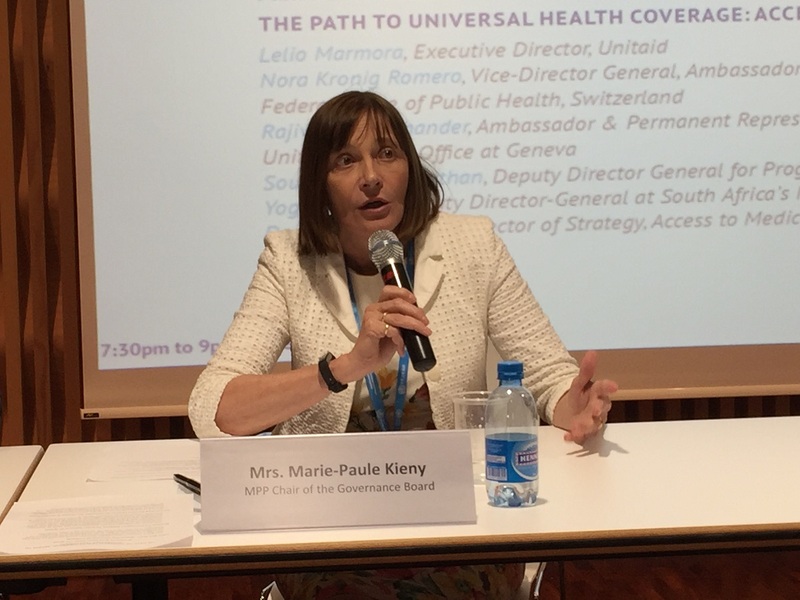 Marie-Paule Kieny, chair of the MPP Board and former WHO assistant director general, said the MPP, which is a patent pooling mechanism through which originator companies provide voluntary licensing, has proven successful and has significantly improved access to cheaper medicines, particularly new HIV medicines in low and middle-income countries. The MPP managed to find a niche, working with a “constellation of actors” and dealing with a complex environment, Marmora said. The first expansion of the MPP (originally the MPP was created for HIV and in 2015 extended to tuberculosis and hepatitis C) corresponded to Unitaid tripling its portfolio in tuberculosis, he said, and was looking very closely at hepatitis C.
He stressed the importance of mapping hepatitis C needs for countries, and cited Brazil’s national strategic plan as an example. 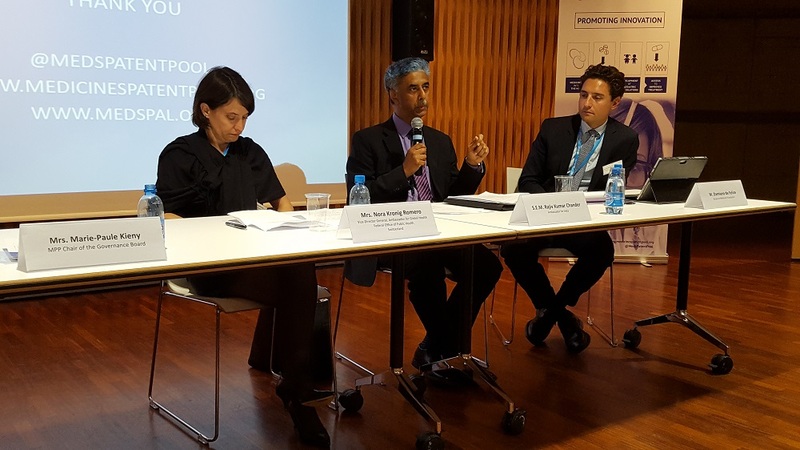 Soumya Swaminathan, WHO deputy director general for programmes, said the WHO was involved in the creation of the MPP and noted that during the WHA discussions, a number of countries supported its expansion. She mentioned the newly adopted WHO 13th General Programme of Work, and its focus on universal health coverage, and the strengthening of primary healthcare and access to medicines and vaccines. Swaminathan remarked on the fact that the MPP “does exclude some countries” and many countries are “moving into that zone” (companies providing voluntary licences to the MPP usually exclude upper middle-economies), but are still meeting access problems. She suggested companies should explore other ways to propose voluntary licences or tiered pricing to those countries, although the WHO would prefer that companies go through the MPP licensing scheme. For Swiss Health Ambassador Nora Kronig Romero, vice-director general of the Swiss Federal Office of Public Health, the issue of access to medicines is complex and is mixing different topics. Switzerland, who financed the MPP feasibility study, she said, is seeking to work across different departments to develop a common understanding of access issues and identify potential barriers. She said it is important to understand how the supply and the demand sides interlink, as access is not merely a supply issue. In the same manner, access is not just about financial availability, but also physical availability, geographical and social accessibility, she said. Potential barriers to access occur at different stages, Kronig Romero said, and also varies across diseases and product categories. She explained that Switzerland funded the feasibility study because the access dimension was considered in the broader frame of the universal health coverage, and because of the importance of an evidence-based discussion. Indian Ambassador to the UN Rajiv Kumar Chander described steps taken in India to increase access to quality-ensured medicines, and on diagnostics and free-screening. He underlined the recommendations by the 2016 United Nations Secretary General’s High-Level Panel on Access to Medicines, and the importance of delinking the price of research and development from end prices. Yogan Pillay, deputy director-general for Health in South Africa, said there is a need to better understand the relationship between the MPP and the BRICS countries (Brazil, Russia, India, China, South Africa). He underlined the neglected area of paediatric formulations, and the importance of getting new products on the market as early as possible, to the last mile, and in a way that is patient-friendly. He too underlined the need to delink the cost of research and development from the end prices of medical products, and stressed the need to manufacture those products in ways that are environmentally responsible. This environmental issue is not receiving enough attention, he said, adding that environmental degradation in the production of pharmaceuticals is established. He said he has mixed feelings about the MPP expansion, as no global funders, such the Global Fund to Fight AIDS, Tuberculosis and Malaria, are covering new areas. There is a question of market potential, he said, as there needs to be a market for generics. Cueni said he was “torn between inquisitive, apprehensive, neutral and potentially supportive,” but cautioned that is has to work for “both sides,” and step-by-step. "MPP Board Gives Green Light To Expansion, Now Has To Identify Candidates" by Intellectual Property Watch is licensed under a Creative Commons Attribution-NonCommercial-ShareAlike 4.0 International License.